Do you like iced coffee? Have you tried a cold brew system before, but were left. . .cold? Fear not–I found the most awesome iced coffee maker, and it’s as easy as filling a bucket. I’m still writing, just not here, unfortunately. Neighbor E says he knows I’m OK when he gets a blog post. The GER pops in every so often. I’m trying. . .but we’re doing OK, and busy as heck. But. . .I’m being harassed. Not by BF or some man that I could do without, but by this website. I get these emails telling me to pay attention to it. Like I haven’t. Oh, wait, I really haven’t. Softaculous backup of. . . .
Wordfence activity for. . . The plugin needs an upgrade. . .
Additionally, people are still trying to hack their way into this website. Why, I don’t know, and it’s from places like Albania and Laos. Don’t they have anything better to do? And on it goes. But the good news is that writing this blog as long as I have has taught me how to use WordPress. I have a few clients who use it, and they grant me access to their sites so I can go in and upload, format and tweak their content. SEO included, and it’s easy with Yoast. So that’s a good thing. Oh, and if you like the new “table of contents,” you can thank my client in Israel for telling me how to do that. I have been shopping, and not just for groceries, although I do that a lot. I look at a lots of different things, primarily online. I’m always interested in something new that will solve a problem or make life easier. BF thinks I’m a little nuts, but I don’t mind. I remind him that my “pill habit” comes from Vitacost. Did you know you can buy moving bags for mattresses? I had no idea–but when we were suddenly given a queen sized mattress set (that we don’t need), I ordered some of these great big giant Baggies for mattresses, and they’re now sealed up tight in the back room. We could actually put them outside in the garage, but for now they’re fine. Fortunately, when we moved mine, we didn’t have any problems. When it’s time to replace mine, we have a new set ready to use. I’ve also replaced a few more things, which I will be posting about as soon as I can. The countertop dishwasher is still humming along, thank heavens, sometimes three times a day. I’ve also finally been to the dentist after more than six years, seen a doctor about something else, and I’ll be getting another eye exam in the next month or so–it’s been a year. If my prescription changed–and even if it didn’t–I’ll be shopping for new glasses again, at Zenni, like last year. Did you see it? It was FAAABULOUS!! The night before, I made some Raspberry Scones. I got up at 2:30, drank coffee, made a pot of tea, and turned on the TV to watch it live. From 3:00 am until the live coverage ended (and I passed out) about 8:00 am, I watched history being made–an American marrying into the British Royal Family. First time in nearly 100 years! Everything went without a hitch, despite all the press from the bride’s side of the family. The music was great, and I wanted so much to give Doria Ragland (Meghan’s mother) a hug. She looked so happy but so far out of her element. Very elegant and classy she was, and now the press goes out to take her picture when she drops by her local bakery for some pastries. The theme was “love.” One of his quotes: “Two people fell in love, and we all showed up.” Oh, yes we did–20 billion of us! (I think.) Fire, as he pointed out, was one of the things that allowed civilization to grow and flourish. But If we can harness the power of love the way we’ve harnessed the power of fire, love really could change the world. Not to be outdone, Saturday Night Live brought the Most Reverend Curry to Weekend Update to talk more about it. Don’t worry, it’s safe for work–and you know that’s not really him, anyway. But it is funny. The other sketch, featuring “Prince Harry” talking to a videographer while he walked through the reception at 2:00 am, was not only pretty funny, but featured costumes that were nearly identical to the ones worn to the wedding earlier in the day. Unfortunately, that sketch has been taken down. Yup–nobody’s drinking yeast-free hot chocolate much these days. That’s OK. I’m back making iced coffee again, but much easier than before. I started drinking iced coffee in the summer of 2011, when Houston went through a heat wave and a drought. The office was parchingly hot, because the AC couldn’t keep up. I just said, “the heck with this,” and threw a fresh cup of hot coffee into a glass over ice. I’ve been drinking it ever since. Two years ago, I told you about how Nick Usborne at The Coffee Detective had instructions and recipes for iced coffee. But I’ve got one better, and I don’t think Nick knows about it. I must tell him soon. I really didn’t mind too much the brewing and cooling process. But when I found this, I snapped one up. 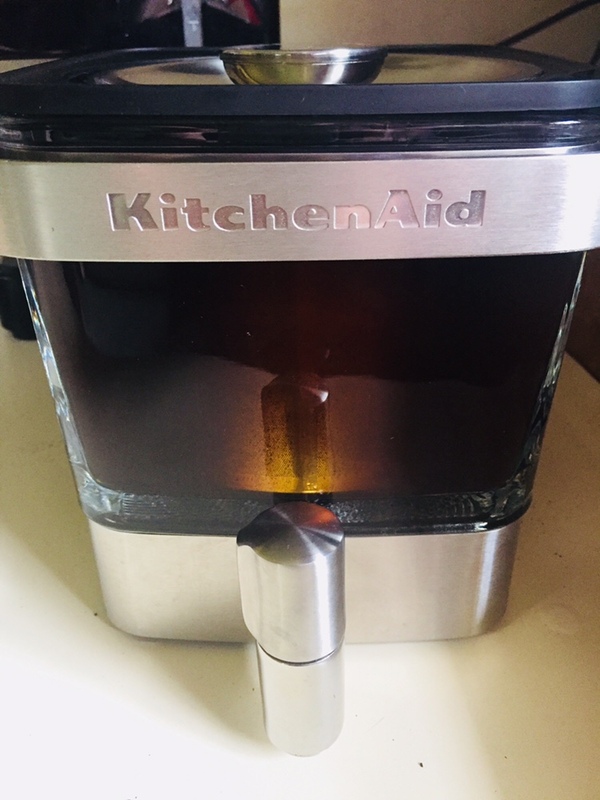 Enter The KitchenAid Cold Brew Coffee Maker! It happened very innocently. I was buzzing through Target on a quick run while BF waited in the truck. Walking through the coffee makers on my way out, I saw this interesting steel glass square sitting there. I thought, “I’ll have to look at that soon.” Didn’t look at the price tag, I just wanted to mentally bookmark it for later. A couple of days later, we watching a TV show called CityLine, a daytime TV talk show out of Canada. They talk about the usual things for the home–new furnishings, stuff for spring etc. I only caught a couple of minutes of it, but they were showing off new things for spring entertaining. What do you know, the guest speaker moves over, and there is this beautiful thing. She starts to explain it and demonstrate while pouring a glass of iced coffee for the host, Tracy Moore. After adding milk and sugar, she hands it to Tracy. She takes a sip, and says, “Oh, yes, mmm-hmmm, that’s really delicious, yes.” (You know how they do that on TV.) You’d have to go looking for the video, but I couldn’t find it myself. Anyway, I looked at BF and said,“I’m getting one tomorrow.” And I did! However, I was not prepared to pay the full manufactured price for it. So I managed to find myself a couple of coupons. First of all, if you’re not using Ebates, you should be (here, use my referral code.) I also checked another browser app called Honey. What this does is look for coupons and promo codes right in your browser that you can use to get discounts on different websites. I put one in my shopping cart, then ran Honey. Found a coupon for 15% off. Wrote the coupon code down, and then went back and started over through Ebates. Now, the shopping trip was registered through Ebates, I used the coupon code and got a little bit of money back. Essentially, I got it for half price. So now it’s time to answer the question, what’s it like to use this to make iced coffee? Well, it’s probably a little better than other methods that are available. Really, it couldn’t be easier, and I took pictures to show you. Take the filter basket, and fill it up with the coffee of your choice to the line, which is hard to see, but there. That should come to 750 g. Make sure the little plastic rim is in place, and set your basket into the coffee maker, then fill it with ground coffee. According to the directions, you poor 34 ounces of water into the coffee grounds, and let them sit for a couple of minutes to absorb. When that’s done, you poor additional 8 ounces of water into the coffee grounds. Once that’s done, take a spoon and push the coffee grounds under the water and make sure all the coffee grounds are wet and absorbing water, eliminating any “dry spots.” Put the lid on it, and leave it alone. When you’re ready for it, the directions say to let the coffee steep for 12 to 24 hours. The first time I used it, I let it sit for 12 hours. The second time, I left for 24. I have to say that I prefer the 24 hour steeping. After your coffee has steps for the desired amount of time, just use a little handle to pick up the coffee filter basket out of the coffee maker. Stand it to one side so that the coffee drains out. Then tilt iin the opposite direction, so that more of the brewed coffee will drain out of the filter basket. Now it’s just a matter of putting the finished coffee into your refrigerator. It has a small footprint, sits right on the shelf, and conveniently allows you to get iced coffee whatever you want. Ready To Drink Iced Coffee? And then fill the rest with milk. It’s kind of eyeballed, but it works for me. At this point, you sweeten, add flavor or whatever you like to do with your iced coffee. You can add regular milk, cream or half-and-half, or you can use one of the alternative milks like almond milk or hemp milk, your choice. Like whipped cream? Add it. Like those fancy sauces that flavor your coffee? Add some. Once you get the basic formula down, it’s all up to you. I know that there is a myriad of ice coffee brewing systems on the market. I just happened to find this one, and it’s so easy and foolproof. Of course, I read a bunch of reviews on Amazon and on KitchenAid’s website before I popped open my piggy bank. (My review is actually on KitchenAid’s website, but I guess I didn’t win the food processor!) But after seeing it in action and seeing how well it works, even non-coffee drinking BF thinks it was a great buy. Especially since I not only got it for half-price, I use it all the time. It arrived a few days later. I’m so glad I bought it directly from Kitchen Aid. Yeup. Exclusive to shoppers of Rouse’s. About $4.35 for that brick. It’s what I had available the first time, and so it’s what I’ve been using. At some point I’ll order plenty of HEB’s wonderful grocery store brand coffee and use that again. But for now, this works just fine. Cold brewing also eliminates the acid that you may get if you make your iced coffee from hot. No boiling pots, nothing hot, and no burns either. I know there’s a bunch of different ways to make iced coffee. And if you’re happy with the way you make it, go for it. If you’re not happy with it, I offer a simple, foolproof alternative. This hands-off method just takes a little planning, and makes it perfect every time. The elegantly designed cube sits right in your fridge at the ready. KitchenAid has also recently introduced a stand for it, but I probably won’t be getting one. We’re not planning a brunch anytime soon. But if you love iced coffee, but don’t like spending a fortune for it, just break open the piggy bank get yourself one of these models. Find a stainless steel cup to drink it out of (especially one that fits in your car’s cupholder so you can take it with you) and you’re on your way to enjoying iced coffee more often. Don’t forget to use Ebates and find it on sale or marked down. Well, sort of. We recently were gifted quite a number of things, including a KitchenAid toaster and 14-cup coffee pot, and some other small things. The caveat is that they’re all RED. No kidding. You’d think I’d be enjoying red dishes, red cups, red bowls and red everything else. But even as a fan of red, after a while your eyes get tired of all that red. I’ll live with it, because we were gifted them from someone who won’t need them anymore. We’ve nicknamed him DG, and I’ll explain more next time. I’ll try to take pictures and add them to an upcoming blog post. Meantime, I hope everyone is enjoying summer, staying cool and hydrated. Now that you know an easy way to make iced coffee, you can enjoy it more often. I have it every day, i the Casa de Rurale, and no driving to a coffee shop.